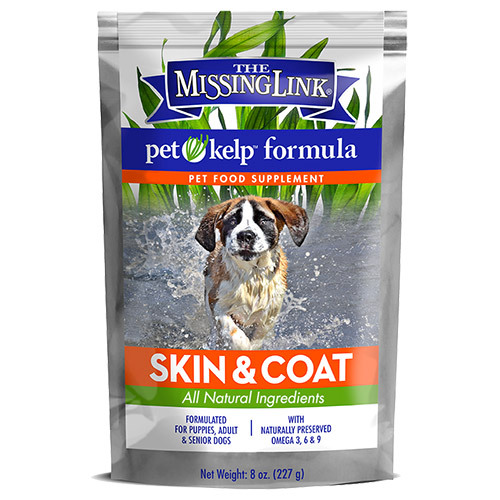 The Missing Link Pet Kelp Skin & Coat blend combines the natural benefits of organic kelp with omega 3, 6 and 9 from organic flaxseed. These ingredients combine to support your dog`s skin, coat, hardiness and overall happiness. With The Missing Link Pet Kelp Skin & Coat blend, add a daily helping of essential fatty acids to your fur kid’s bowl to help with shedding, and soothe dry or irritated skin. Organic Dried Kelp (46%), Organic Flaxseed (42%) (source of Omega fatty acids), Organic Sunflower Seed (3%). Combine with food. Can be sprinkled dry or mixed with water and poured over food. Feed according to pet`s weight. Below are reviews of The Missing Link Pet Kelp Formula - Canine Skin & Coat - 227g by bodykind customers. If you have tried this product we'd love to hear what you think so please leave a review.